Pro version 3.06 now available. 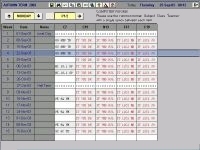 Description: "For easy booking of up to 10 (or more) periods per day in up to 10 (or more) computer rooms or other resources by staff themselves across a network. It is easily updated with new details each term, season or however you want to divide up your year. You can easily customise it for use by any establishment and any language at the click of a few buttons. Full details and very comprehensive instructions are provided. Bookings can be downloaded from Sims.net or other timetable software." This is a free trial version for anyone willing to give it a go and provide me with some feedback. We have been using it very successfully for many years at my school so I have now decided to refine its administration so it can be used elsewhere (and here when I leave). Description: "For the easy entering and creating of references for university or college entrance or any other purpose. You can easily customise it for use by any establishment at the click of a few buttons. Once set up this software will practically run by itself. When changes are needed it is very easy to manage via the many intuitive tools and wizards provided. Full details and very comprehensive instructions are provided. All school data can be downloaded from Sims.net or other management software." 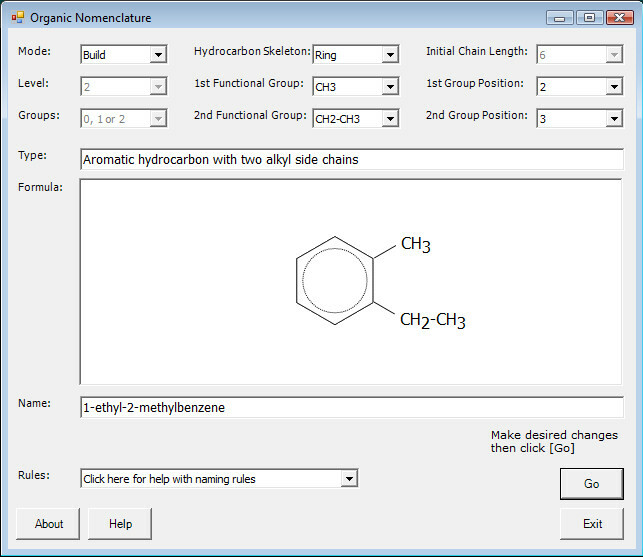 Description: "This program is ideal for GCSE and A' Level revision, it provides a very simple approach to the rules for naming organic compounds. It covers all the common functional groups for alkyl and aryl compounds with random examples generated and named, or you can construct your own molecule to be named. I originally wrote this program in 1984 for the BBC Micro and have now recompiled it using Visual Basic 2008.net to work on a modern PC running MS Windows." Status: Shareware, updated: 17/12/07 - Installation is fully automatic & RM Connect 3 network friendly. Description: This add-in provides an extra menu and toolbar for many European characters. You can simply highlight a letter, or type it and click a button to add an accent. Included are all the characters you need for writing in French, Spanish, German, and Welsh. There is also a quick root to symbols for producing mathematical and scientific equations. Clicking on a named language button provides another method for inserting characters and also sets the language and dictionary for the whole page. If you have that language installed, it will be used, if not it switches off the 'spell-check as you type' function (which could be useful)." In MS Word 2007 the tool bar appears on the Add-Ins tab. The other 'extra' buttons shown here in the standard toolbars, an Adobe pdf converter and also a page footer which includes the username (network username too) are also provided as separate installations within the zipped package. Description: "This will convert any printable document to Adobe PDF format. It makes use of a printer driver so will work with all software. To make it even easier to use this converter I have created a simple utility to add a toolbar button to Microsoft Word - download and open pdfcreator.doc You can also download a ready-made RM CC3 package - PDF Creator.zip"
Description: "A program that mimics this event for use in school. Links directly to the Internet for information on the candidates for each of the four main parties. A voting booth is provided and results worked out at the end of the election. Easily updated for changes to the title of the election, candidates' names and internet addresses. Requires Visual Basic 5 runtime files."